Every person in the world has felt the influence of the Holy Spirit at one time or another. For some, it's the conviction of "sin and righteousness and judgment" (John 16:8). For others, it's the comfort, guidance, and strength He gives. To some, the Spirit is as mysterious and unknowable as a night wind passing through the treetops. To others, He is as close and inviting as a friend across the table. But even those who know the Holy Spirit personally have questions about Him. As Oswald Chambers said, "The Spirit is the first power we practically experience, but the last power we come to understand." That's the reason for this book. What gifts does the Spirit give? How can I be filled with the Spirit? Will the Spirit ever leave me? We've received all these questions and more since GotQuestions.org was founded in 2002. To find the answers, we opened the Bible, the one book inspired by the Holy Spirit Himself. In searching the Scriptures, we learn of the Spirit's nature, His work, and His will. May the Holy Spirit use the questions and answers in this volume to increase your awareness of His presence, encourage your heart, and empower your faith. 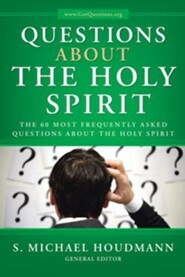 I'm the author/artist and I want to review Questions about the Holy Spirit: The 60 Most Frequently Asked Questions about the Holy Spirit.